Local Western food lovers who crave for Unique Western can visit the fine dining Wangsa grill By Chef Zubir at Jalan Dataran Wangsa , Wangsa Melawati . The restaurant is located at Wangsa maju area and you can see the restaurant from the main road and easy to locate the place by using Waze or google maps too . Wangsa Grill specializes in Western and Fusion Cuisines Served an appetizing array of salads, soups, pastas, a wide selection of main dishes featuring steaks, lamb, beef, poultry and seafood to sides and light-bites like desserts too . Wangsa Grill is HALAL Restaurant , No PORK and No ALCOHOL is served here in Wangsa Grill . we were greeted by friendly staffs . As they led us to our table , The interior of the restaurant is quite modern and classy . The plants in the restaurant gives a soothing green touch to the chic interior. As for the seating area , there are two sections inside and outside of the restaurant , Wangsagrill environment makes me comfortable and feel cozy to dine my meal . From outside you won't expect that Wangsagrill inhouse decoration was like fine dining atmosphere . Decorative wall that features newspaper clippings on Chef Zubir and his creations and achievements . At First , I don't really know who is Chef Zubir until I have met him personally and himself was at the restaurant serving our foods . It's was a pleasure got to meet him because normally he will be going around on his outlet around Klang valley . Knowing More about Chef Zubir , He graduated from the School of Hotel and Catering Management UITM in 1988 and received a Diploma in Chef Training upon graduation . From then onwards, he has served several international brands , such as The Hyatt , Melia , Sheraton , JW Marriott , Hilton , Grand Plaza Park Royal , Le Meridien and The list also includes six months of intensive training at the Anton Mossiman Exclusive Dining Club in Belgrave Square , London . Zubir also involved in TV cooking show as a Host for ‘Young Professional Chef’ RTM 2008 , Host and Principal of Akademi 1001 Rasa ‘BABAS’ 2009/2010 TV9, Host/Jury for Masterchef Malaysia/Celebriti/All Star, Astro TV Cooking show 2011/2012/2013/2014 . 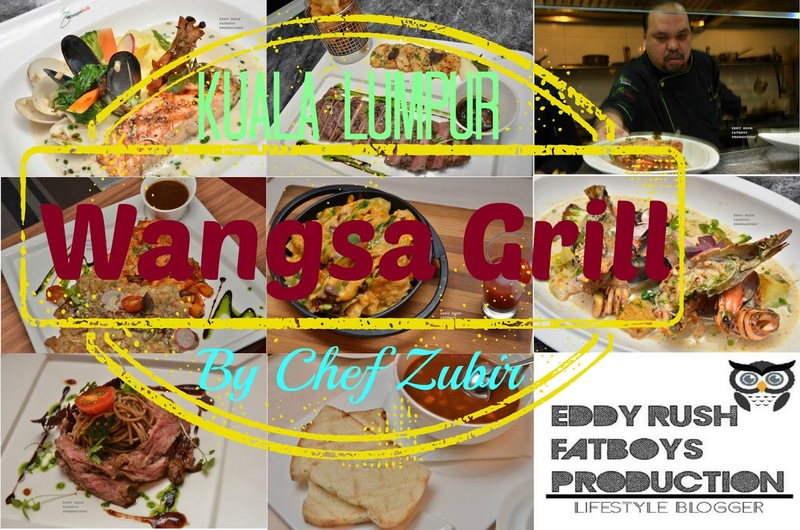 Chef Zubir owned Five Outlet if not mistaken , Wangsa Grill by Chef Zubir @ Wangsa Maju , Vista Brasserie By Chef Zubir @ Shah Alam , Brasilia Churrasco by Chef Zubir @ Bangi , Laman Grill by Chef Zubir @ Kajang and The Cut Steakhouse & Burgers by Chef Zubir @ Subang . In thick brown oxtail broth with potato and assorted vegetables , served with crusty bread . Marinated sizzling beef , tossed with buckwheat noodles , white fungus , wild mushroom , baby greens , hoisin ginger garlic dressing . Barbeque crispy Nacho's , pilled up with pico de gallo , mexican guacamole salsa , ground spiced beef , baked with melted cheese and served with strawberry melon shot . Medley of grilled atlantic sole , akame tuna , slipper lobter manila clam , chilean mussel baby squid , tiger prawn in green curry flavoured crustacean emulsion served with flower bun . Fork smashed idaho potato , braised fennel , kaffir lime coriander infused crustacean a la nage . Chargrilled and sliced medium beef sirloin , wilted spinach cream , golden brown crispy vegetables tempura , wasabi aioli dip . Beef fillet mignon , braised shot ribs , sirloin pillow oxtail conchiglie , chicken ballotine , stuffed chicken wing and will mushroom ragout . Charbroiled on lava stone , topped with wild mushroom ragout , served with witled vegetables and flavoured flat pasta . Bourbon Vaniila ice cream , marble chocolate cigar , mix berries compote . Red Sponge , layered cheese frosting , mango sherbet . Assorted of Berries , burnt orange sabayon , oreo walnut crumble , strawbeey ice cream . We Had a great dining experience here and the food is delicious much satisfying . Even thou the price is kinda pricey but it is really reasonable with the quality of the dishes that served by Sous Chef and Station Chef .